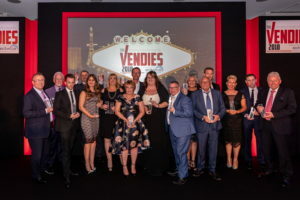 Designed to reward the people, products and services that make the vending and water industries a success, the 2018 Vendies took place last night (2 October) at the Forest of Arden Hotel & Country Club, Birmingham. This year’s event began back in May with the entry and nomination stage, when the industry was invited to put forward its most outstanding brands, products, people and services for consideration. An expert judging panel, comprising leading names from across the water and vending industry then decided on the finalists, before asking the industry to vote in the majority of categories. And just to add to the excitement, guests were asked to vote live in the Best New Product category with the ‘on the night vote’ added to the existing one to get the winner, later revealed as Burts Jim Beam Original BBQ Crisps by Burts Chips. Guests were treated to a fantastic drinks reception, three course meal and entertainment from Canadian comic Sean Collins before the award presentations began in earnest. First up was the manufacturer suppliers and Best Machine Innovation, sponsored by Lavazza, with the Novara Protein Shake Solution from Coffetek Azkoyen taking the top spot. Best Supplier Website went to Westomatic & WestoNET, while SB Software emerged victorious in not one, but two categories – Best Customer Service for its Client Support Team and Best Ancillary Product or Service for Vendmanager. Best Payment System, sponsored by Siemens was awarded to Nayax for its VPOS Touch, while, Barry Callebaut Beverages’ Le Royal Choco Green was named the hottest product in Best Beverage brand. Having already picked up the award for Best New Product, the team from Burts Chips returned to the stage to collect the award for Best Snack/Confectionery Product, this time for its Crispy Smoked Bacon Crisps. Next up was the Water categories and the Customer Service Award, sponsored by the EDWCA which saw Divine Water’s Aftersales & Delivery Drivers being recognised for their outstanding work and commitment. The Supplier Recognition Award went to Abbeychart for its Installation and Kitting Service and the Innovation Recognition Award to 4 Aces for ‘Reducing Environmental Impact’ (water sector). The final award in the water categories, the Outstanding Contribution Award went to Tracy Corroll of the EDWCA for her tireless work in the industry. In the operator categories Express Vending picked up three awards – Best Route Operator (Hannah Brown), Best Operator Website, sponsored by Tower and Best Customer Service, sponsored by Coffetek (Amy Brown). Ann-Marie Fox from Apple Vending was named Best Area Manager, while her colleague, Simon Trott scooped the award for ‘Best Service Engineer’. Excel Vending meanwhile, was successful in two categories, Best Regional Operator, sponsored by Abbeychart and Best Overall Opeartor sponsored by SB Software. The final award of the evening, the Lifetime Achievement Award was presented by the managing director of NIVO, Graham Kingaby to Steve Gallagher of GEM Vending to a standing ovation. A charity raffle in aid of Alexander Devine Children’s Hospice raised £1, 160. Luke Enticknap of Express Vending won the prize, a Trailfinders voucher to book tickets to Las Vegas or a destination of his choice, courtesy of Siemens.